It’s 5:30am and I can’t put off getting up. I’m unsure of the exact amount of sleep I’ve had as I don’t have a very good phone signal at the William Bay shelter. This also means I won’t be able to post any updates for a while. I’m sitting here in my sleeping bag having breakfast and writing for when I can post. Today I’m heading towards the Boat Harbour campsite which should be around 21km away but I also have to cross the Parrys Inlet. Given the high tide and the strong winds that started about an hour ago, I’ve decided to opt for the road diversion. Once I reached the diversion point there was a sign saying the beach was dangerous and to take the road so good planning on my part. Long walk and not so exciting and I kept on passing lots of tempting food stores which luckily were closed as it was too early. 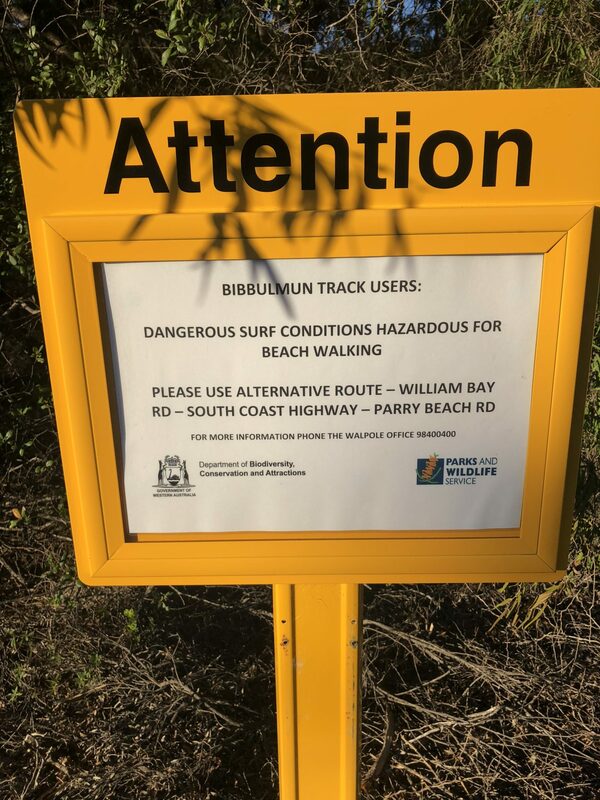 I connected back with the main track just past Parrys Inlet and headed on to Boat Harbour campsite, all be it a bit slower due to the heavy soft sand. Good day overall at just over 30km.